HERITAGE SCULPTURES specializes in the sculpting and production of fine collectible busts, figurines, and desk/table top ornaments, ranging from dogs and sports subjects (i.e., trophies) to famous personalities. HERITAGE SCULPTURES is pleased to announce an expanding line devoted to the celebration of the �Person of the Twentieth Century� and "Greatest Briton," Sir Winston S. Churchill. All HERITAGE SCULPTURES products are researched meticulously for accuracy in detail and crafted using high grade casting resins and granulated marble, in bronze, white, or ebony finish. Many of the pieces are produced as a numbered, limited edition. The premier piece of the Churchill line of products is �Winston Churchill The Artist;� this is followed by a projected collector�s series of ten busts, each representing a likeness of Churchill clothed in uniform and hat reflecting a period of his life, from his commission in the 4th Hussars (1895) to his investiture with the Most Noble Order of the Garter at Windsor Castle (1954). Two of the series of ten busts currently available are Churchill attired in Royal Air Force and Naval uniforms. Additional busts of different personalities featured in this website include Admiral Horatio Nelson, Emma Hamilton (Nelson�s mistress), and Sherlock Holmes. The owners/artist/sculptor of HERITAGE SCULPTURES are Tony Leonard and his wife Pearl (pictured above with their creation �Winston Churchill The Artist�). Tony was born in the East End of London and was evacuated as a child during the London Blitz of World War II to West Sussex. Tony�s early training was obtained at the London Academy of Art. Similar to Winston Churchill changing his hats, Tony�s attention throughout his career has been directed to a host of trades, which included business ventures with his father. 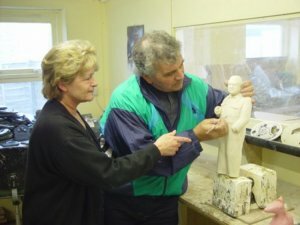 Now, Tony and Pearl devote their attention between family and the business of sculpting, painting and creating magnificent pieces of art like �Winston Churchill The Artist� at their HERITAGE SCULPTURES studio in West Sussex, England. Address all purchase requests and inquiries, including requests for price information, to the email address provided below. Dealers� inquiries are welcome.